Turn your Monitor off whenever required with Turn Off Monitor Utility for Windows. Use a Desktop Shortcut, Keyboard Shortcut or other options to quickly Turn Off your Computer’s Screen. Whether you are using a Laptop or a Desktop Computer, the Software Application provided here is really handy tool to save Power and give you full control over your Computer. The Turn Off Monitor Application is provided on a Free to Download & try basis. You can Download and Install the Software right now for Free without any email registration. The Utility does not have any nagging screen or reminders for payments and is a fully functional software application. Yes the Turn Off Monitor Utility works well with Windows 10, Windows 8.1, Windows 8, Windows 7 and other Windows Versions. The Installation procedure is quite simple and is a standard software setup. The above Video Tutorial displays how you can Install the Turn Off Monitor Application and get started. An Icon in System Tray is created by the software allowing you easy control over the software features. Just Right Click on the System Tray Icon of the Turn Off Monitor Utility and use any of the numerous features offered by the software. 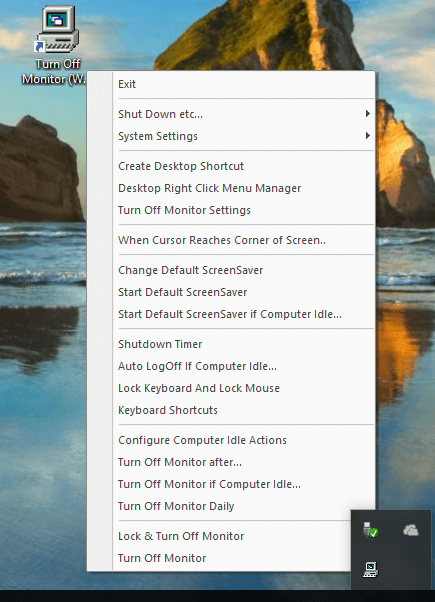 For easy Access, you can also create a Desktop Shortcut to Turn Off Monitor quickly and easily. Move Mouse Cursor to Turn On Monitor Automatically. Press any Key on Keyboard to Turn On Monitor and start using your Windows Computer. The Monitor can be turned On by any application running on your Windows Computer as controlled by that application when your attention to your Computer Screen is Required. Windows Operating System can also Turn On your Monitor if there is any Critical Alert and your Attention is required. In case you are using Multiple Monitors connected to your Windows Computer, all the enabled Monitors would be Turned Off by this Turn Off Monitor Utility. Yes switching On your Multiple Monitors can be done as outlined above for a single Monitor Windows Computer. The Dual Monitor Software (MurGeeMon) offers more control over Dual or Multiple Monitors and is available for Download on a Free to Download and try basis. 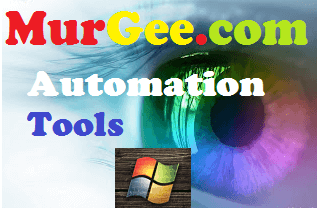 Apart from helping you on managing Multiple Monitors, the MurGeeMon Utility can also assist you in Moving Mouse Cursor across Screens, Manage Wallpapers, provide you Keyboard / Desktop Shortcuts to Control your Windows Computer. Desktop Shortcuts are the easiest ways to communicate with your Windows Computer and now you can create a Desktop Shortcut to Switch Off your Monitor without sending Computer to low power state like Hibernation or Sleep Modes. By just Switching Off your Monitor, you can still have you Computer download files for you, Play Music with an Audio Player or do any other processing. When creating the Desktop Shortcut to Turn Off Monitor, you can optionally enable Audible and Visual Confirmation so that whenever your Monitor is turned Off with Desktop Shortcut, you are well informed. In case you would like to schedule the Automatic Turning Off your Computer’s Screen, you can copy the Command Line of the Turn Off Monitor Desktop Shortcut and call it from a Batch File or from any other Application. Using a Blank Screen has it’s own advantages and disadvantages over Turning your Monitor Off. When Monitor is turned off, it can be turned on again by simply moving mouse , a keystroke or by a software application. A Blank Screen instead can be controlled in a much more sophisticated way. The Blank Screen which is basically a Black Window limits the amount of Glare coming out of the Monitor, however it does not saves power. A Black Screen Utility is also included in the Turn Off Monitor Utility which can be launched using the Desktop Shortcut as displayed in the Screenshot above. 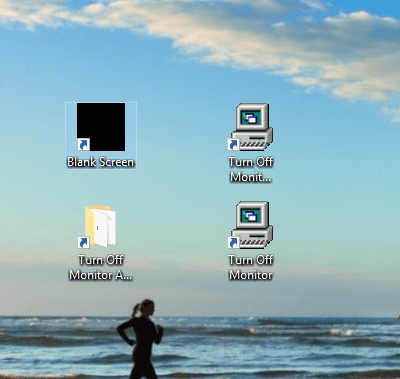 using the Windows Lock Screen can also be an alternative, however the Black Screen Utility is much easier to control and has been designed to handle the scenario where Turning Off the Monitor might not yield the desired results. There are lots of other features offered by this small and useful utility to Turn Off Monitor. You can take full control over the power state of your Windows Computer with this Utility. Given below are few of the other features offered by the Turn Off Monitor Utility. Most of the other features are controllable from the System Tray Menu, however a few features are available in only Turn Off Monitor Settings Screen. 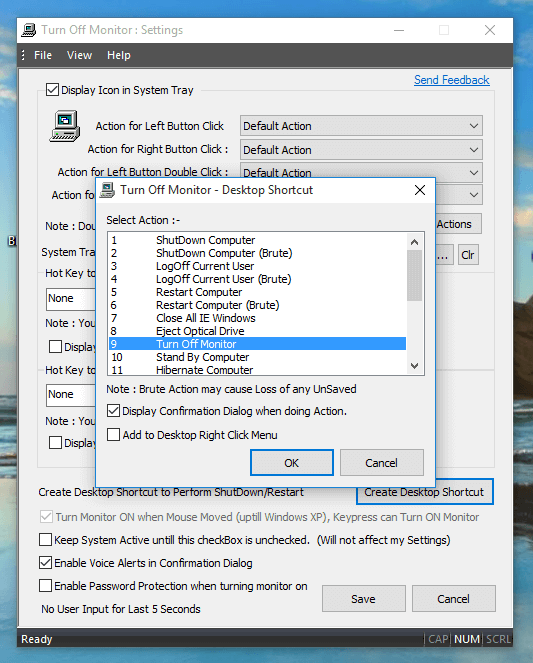 Create Desktop Shortcut to Turn Off Monitor, Shutdown or Restart Computer. Automatically Sign Out whenever the Computer is Left Inactive for more than a pre-defined duration. Start Screensaver instantly or Launch the Control Panel Applet to Configure Screensaver Settings easily. Use Keyboard Shortcut to Turn Off Monitor and optionally enable Visual and Audible Confirmation. Add Menu Commands to Right Click of Desktop for quick access to various features of this Turn Off Monitor Utility. Yes there is still lots more offered by this System Utility and is available for you right now. Download and try out the Turn Off Monitor Utility on your Windows 10, Windows 8.1, Windows 8, Windows 7 or even on Windows Vista Computer and take full control of your Monitor(s).